Every so often, I thought it would be fun to post items I find at thrift shops, estate sales, etc., that I won’t necessarily sell or possibly just items that I find interesting. Maybe there’s some history maybe not. I’m a big fan of sites that show off their yard sale finds so I thought this would be fun. I realize I already post items I don’t necessarily sell but I wanted to post them and not write fictitious accounts of the items, but instead tell like it is! A few days ago I went to this estate sale in a house by the sea. It was a lovely old house, probably early ’20s and I wandered in and out of its rooms and odd little halls and admired the view of the sea from the sun-porch. Years before my mother’s best friend had lived right next door to this house in beautiful old Victorian? that had been in the family for years. She claimed the house was haunted and every time we visited she’d tell us another story, “oh so and so tossed the sheets around like crazy up in the linen room,” etc. I used the bathroom once and the single light bulb above me went out instantly above me. Strange as it was, it seemed like old news as our house about a mile away was completely haunted or so my mother said. I believe I was the only one who never heard any noise or saw any ghosts but over the years, many family and friends heard much. The wheezing sea captain who rapped on the door and who had asthma (which later, we confirmed was true) the sailor’s wife waving her hankie in the drive to some sailor who was supposedly on his way home, the little girl in the borning room (yes, supposedly that room was used for birthing) who my mother claimed was not a good ghost. Thankfully I never saw her but a friend did. But that’s a whole other story and meanwhile I was at this estate sale…and heard various people gossiping about the owners. “…well the older generation worked for the money but the newer ones…” or “…yeah I saw her once, big sunglasses, bone thin, driving around… or “just rented it in the summer..”. There was a magic lantern for sale which was quite beautiful and lots of odds and ends. 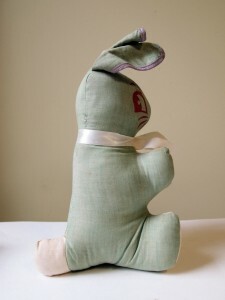 I bought a strange rabbit from the 1950s (for sale on my site, ok, I guess somethings in this post are for sale) but left its friend, a complete replica but a little dirty but afterward felt bad I had taken him from his friend. Now, he’s probably sitting in a bin at the Salvation army, crying and lonely. 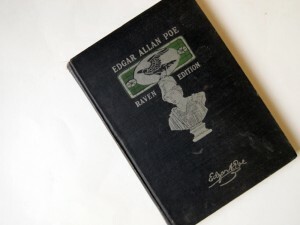 I browsed through the old books and found a Poe book, a ’60s Milles Borne (strange that this is one of Michel Houellebecq’s favorite games) game, tempting yes but I have one already. Wasn’t much of interest and I left feeling always a little sad after such estate sales as the owner’s life is always on display. In this case I suppose it was their secondary life or summer existence so I didn’t feel too bad. Soon it would be cleared out, and the empty house will sit by the sea waiting for its next owner, possibly another summer resident who will only use it for summer evenings–filled with endless milles borne games, gossip, gin and reckless runs down to the warm sea. Debi McDowell – You have an amazing gift (in words and pohthgrapos). We are so grateful they found you. Besides the fact that you had 2 incredibly beautiful people to photograph (I have bragging rights), these 3 pictures are amazing!! We can’t wait to see the finish project. This was a busy week, but we enjoyed every minute of it. Getting to spend time with Kaelins wonderful family and friends (and our son Justin too) was icing on the Wedding cake. Thank you again for being a friend and not just the Photograher . Remember to take along plenty of vitamins and sinus medication on your next shoot. God Bless You.